Fast casual restaurants are on the rise all across the country for the past several years. According to the market research company, The NPD Group’s Fall 2017 ReCount® restaurant census, fast casual chain expansion increased units from 19,231 units in 2013 to 25,118 units in 2017. Why It’s Newsworthy: Athens is home to a popular and robust food scene full of all types of restaurants. However, in recent years there have been more and more fast casual dining restaurants popping up all around town. New restaurants like Wings Over Athens, Koa Bowls, and Burgerim are just a few of the new fast casual dining spots coming to downtown Athens. The appeal of these fast casual restaurants is due to their convenience and quality. Heather Lalley, editor for Winsight’s Foodservice Group, says that, “Fast casuals offer transparency and customization, at an affordable price point.” People are often in a hurry and don’t always want to sit down to eat. This is especially true for the younger generations. According to a USDA Report, Millennials have very different eating habits than older generations. In fact, the report says “millennials may have a higher preference for time savings when it comes to food consumption since they dedicate less time to eating meals than do older generations.” This is further proven through the statistic in the same report that millennials spend around 12 minutes less eating and drinking during each meal than traditionalists (the generation born before 1946). Also, people are more interested in eating healthier and higher quality food with fresh ingredients rather than a fast food meal. This was shown in the same USDA report when it concluded, “As Millennials become richer, they apportion more of their Food at Home budget to vegetables, suggesting that the millennial generation may have a stronger preference for fruits and vegetables compared to older generations.” The combination of these factors cause for a higher demand for similar restaurants because this is what people are most interested in. Fast casual restaurants almost always are limited-service or self-service formats, have an average meal price between $8 and $15, have made-to-order food with more complex flavors than fast food restaurants, and most often will not have a drive thru. For example, fast casual restaurant have smaller and more focused menus. This allows for more time and preparation to be put into cooking their food instead of churning it out like fast food chains. The service is much quicker than a casual dining restaurant and allows customers to be more in control of the whole process. A few prime examples of these restaurants would be Chipotle, Panera Bread, Shake Shack, or Panda Express. According to Google Finance’s quarterly financials, as of June 2018 Chipotle has had a revenue increase of 8.3 percent. 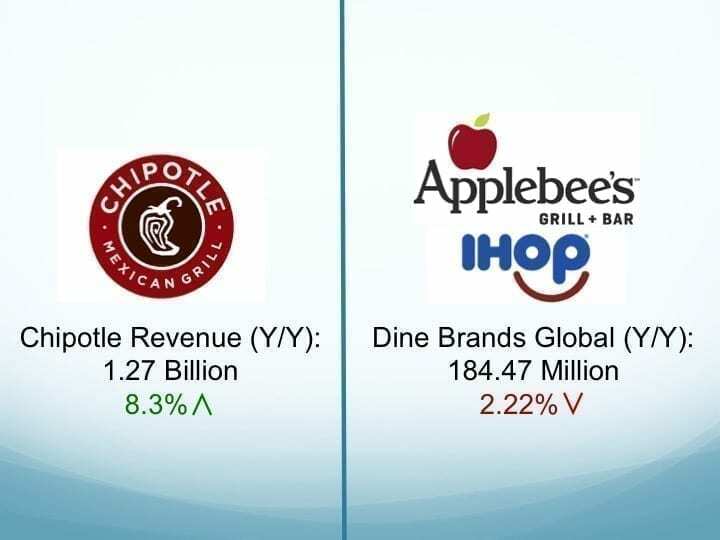 Dine Brands Global, which owns Applebee’s and IHOP, has had a 2.2 percent decrease in revenue in that same time frame. To see what type of restaurant younger people enjoy most, I sent a questionnaire to 300 UGA students. 90 students responded with 92 percent of them indicating they preferred fast casual dining compared to casual dining. 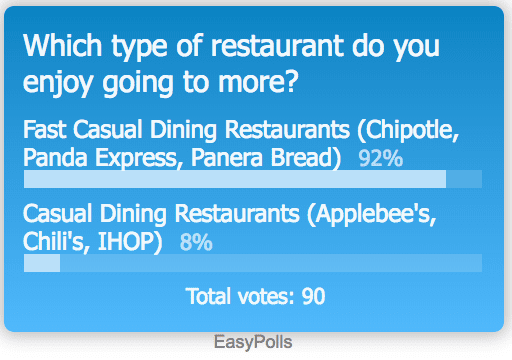 The results show that college students have a strong preference for this style of restaurant, and prove that casual dining isn’t as popular among younger generations. Athens has a large number of classic restaurants like Weaver D’s, The Grill, and Mama’s Boy that have made it a popular food destination for years. The addition of more fast casual restaurants shows that Athens is changing with societal trends. Athens has a mix of classic restaurants and new fast casual dining spots that create a diverse food culture. This brings more opportunities for Athens in the future to make itself an even more popular food city. Cole Rogers is a senior majoring in Journalism.